But they don’t have to. 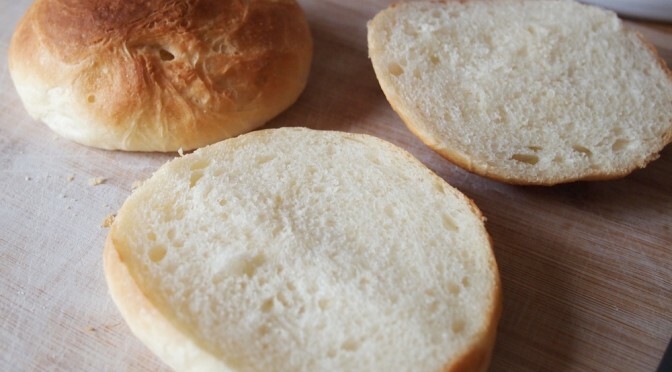 I found this recipe online yesterday for homemade hamburger buns and tried it out. It was a great success! I had my misgivings about kneading dough. But this recipe looked pretty easy. And it was! I made it with minimal adaptations — converting the measurements to mass (where sensible) and cake yeast instead of the instant or dry active variety (big thanks to traditionaloven.com’s yeast converter. Here’s my version. Adapted a recipe from the Kitchn, and they’re perfect. This part is a straight lift from the Kitchn‘s recipe. It’s not as much work as it seems. Probably just enough to keep you from making hamburgers all the time. Stir the yeast and warm water together until dissolved in your stand mixer. Whisk the milk, egg, oil, sugar and salt together in a separate bowl. Add the milk-egg-oil stuff to the wet yeast in your stand mixer. Add the flour to all of that and stir by hand until you’ve got what they call a “shaggy” 1 dough, with no dry flour bits visible anymore. Knead on low for 10 minutes, walk away, and do something else productive. You want smooth, bouncy, and tacky dough at the end of the kneading period. Let the dough rise, covered, for about an hour. Direct sunlight on our mixing bowl on a warm day seemed to do the trick. I got the best rise ever out of this dough. Form 8 tight balls of dough — really squish the air out of them while rolling them into balls. You’ll need plenty of flour on your hands and at least a little on your work surface. Let the balls rise another 30 minutes (at least) on the baking sheet (consider a sheet of parchment). Preheat your oven to 375°F / 191°C. Brush the melted butter onto your bun balls, then bake at least 15 minutes until golden. 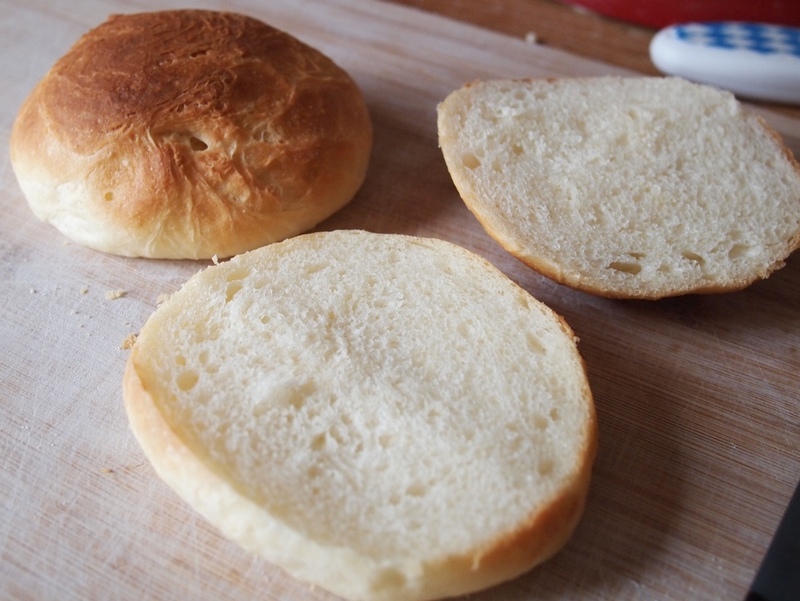 Without the parchment, you might need to scrape the finished buns off the sheet. Let them cool before slicing them. Next Next post: August 2014 Bridge Update — wo ist der Bruckmandl?